The Dinky model of the now almost forgotten Rex was introduced in 1934, forming set 51 together with its companions Europa, Queen of Bermuda, Strathaird, Empress of Britain and Britannic. With her original 51,062 gross tonnage the Italian Rex was the biggest (not the longest) liner model in the 51 series of Famous Liners. It exceeded the German no. 51b Europa in size by 1,316 gross tons. Both of them were the only non-British ships in the range. Though belonging to the bigger ship models (152 and 165 mm long respectively), contrary to the Queen Mary (and Normandie) the Rex (and Europa) consisted of one single casting only. 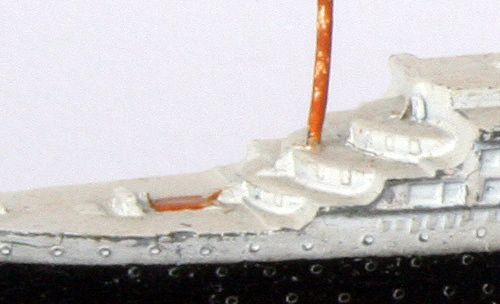 The single casting was supplemented by two separate masts of wire, inserted into the appropriate deck holes to complete the model. Manually applying the tiny green band, neatly below the red funnel top, must have been a tricky job, a reason to usually place the green line a little bit lower than reality would prescribe (see photo of the real one below). The correct distance is one band width below the red funnel top. But this hardly affects the modelâ€™s realism and its fair accuracy. Ventilation intakes next to the funnels were accentuated by a touch of red paint against the funnelâ€™s sides, other individual intakes have the same red touches. The main superstructure is white, on top of the all black hull. Besides the colourful funnels and the red ventilation intakes a few other details were picked out with touches of contrasting paint. The front deck hatch is painted the same brown as the masts and one touch of blue reveals the swimming pool aft. The overall representation of the real ship, with its nice, pronounced sheer line is very nice and crisp. From below the familiar imprint is visible, cast into the inside of the model. Like all contemporary Dinky Toys many examples of the Rex model have serious fatigue, the photo above showing the difference in size which can occur as a result of that destructive process. The Rex was the luxurious flagship of the Italian Line (Italia, Cantieri dell' Adriatico, TriÃ«st). 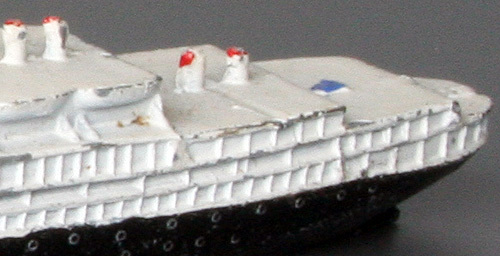 The detail shows the two Flying Fortresse passing along the ship. 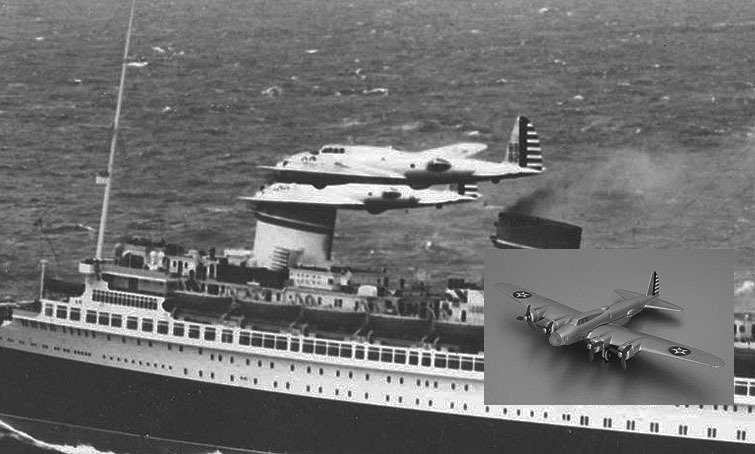 In fact this early version of the WWII American bomber was represented by a Dinky model as well (see inset, Boeing 'Flying Fortress' / Long Range Bomber no. 62g). Both triumphs and bad luck were the shipâ€™s fate. Her maiden voyage in September 1932 was a disaster but in the subsequent year she took the Blue Riband over from the other ship modelled by Dinky, the German Europa.The Blue Riband (trophee above) was the reward for the fastest east-west crossing of the Atlantic. Her sister ship, in the shadow of the glorious Rex, was the Conte di Savoia (48,502 tons gross), not with an overhanging stern, like the Rex, but easily identifiable by her a cruiser stern (like both Queens). In 1935 the Normandie, another famous liner, modelled by Dinky France (no. 52c), took over the Blue Riband from the Rex. This triumph was followed twice by a competition Normandie-Queen Mary, Queen Mary winning in 1936 and definitely in 1938. The Rex ended as a victim of war. It was sunk near Capodistria, TriÃ«st, salvaged again, but apparently useless, sold for scrap in 1947, scrapped on the spot 1947-1958. 1. The set presentation box is well known, even showing two quite different label versions. However, like other small single Dinky items, it must have been sold from trade boxes too. Or not ? Are examples known ? 2. Quite surprisingly, a single presentation box for this model showed up in the 29 October 2009 Vectis auction of Ken McRaeâ€™s collection. The box lid is without illustration label. The company's name is now 'Italian Line' instead of the usually mentioned 'Italia Line '. This packing is very unusual as presentation boxes of this kind were thought to have been adopted for the Queen Mary and Normandie (as shown above) only. Are more details known about this box, for example its provenance, possible printing date etc ? Ken McRae, on this DTCA forum too, or the present owner may have some additional information ? 3. Now that this single Rex presentation box appears to exist : are other similar boxes known for some other Dinky ships of the 51 series? Especially the similar sized Europa might be expected to have been sold in such a presentation box too. I hope this Rex record may stimulate some discussion: answers or even more questions! The following seven posts have been transfered from a duplicate thread. Some weeks ago I found a boxed model of Dinky Toys 51c "Rex" liner in an unmarked Dinky style box. Inside the box the insert mentions ITALIAN LINE above the model and LINER "REX" under the model. Also mentioned is the Length, Height to top of mast, Tonnage and Speed of the ship. The model itself is marked as usual. I did not find any specifics compared to my other Rex. My initial thoughts were that it perhaps was a promotional made for the Italian Line, but I was not sure. I asked John Beugels and he confirmed that it is a very rare pre war promotional. I found it on eBay, it came from an estate. Probably it was bought onboard the actual ship, during a crossing. Might have been a gift to a lucky boy. Or a souvenir bought by Italian immigrants to remember their trip. We will never know, but as it is so rare I wanted to share this with you and it deserves its own thread. This ship is certainly very rare specially with a good box but is it a promotionnal ? I already have a similar picture and the box is exactly the same. However I do not have adifferent box without for example "ITALIAN LINE" which would not be evidence but only a clue to make wour box a promotionnal. I suggest to delete the words "Pre war promotional" from the title of this thread until we are certain that there is a promotionnal Rex. The discussion about is or is'nt a promotionnal is open. This is great Rob, the one you talked me about already some weeks ago. Apparently it is not the same copy. In my opinion it is not a promotional, because the model and the box (though rare) have the regular Meccano finish, no reference to a special occasion or the Italia Line itself. The box has exactly the same layout/lettering/colour/shape as for instance the first 1934 534/Queen Mary boxes. A very desirable item indeed ! Thanks for showing us this very rare box with ship Rex. It is nice to have contributors like you to give us more information on the extreme rare Dinky items. It is for sure not a standard Meccano item. Until now I have seen three of these boxes, including yours. One was owned by my friend Ken McRae and sold at Vectis 2013 for Pounds 400,-. I have send you pictures of the box. The other was sold through Ebay. From time to time Meccano did promotional items pre war and I have also some in my collection such as a DH Comet for store Lewiss. On these boxes there is no printing Dinky toys. It is difficult to find information on these promotional boxes however some research can be made. Were Meccano decided to produce a individual box for Queen Mary and Normandie, this was not done for the other liners. We can compare prices from pre war catalogues and see that Queen Mary with box is always more expensive then the other liners. The difference is of course the individual box. Catalogues with prices from my collection. Queen Mary 1,-, Normandy 1/6, both with box. Europe/Rex ( approx. same seize as Queen Mary) 9d. Europe/Rex 3.00 lire. Queen Mary is not in the list. Queen Mary with box 10 Bfrs. Only Norddeutscher Lloyddampfer at 0,75 RM. Queen Mary and Normandie with box 6 Frs. So Meccano only offered QM and Normandie with boxes as can be seen from the differences in price. The other liners were only available in sets or in trade boxes of six I presume. Until now I did find tradeboxes for the Battleships but not for the liners pre war. But you can find a lot of liners separately, so most likely from trade boxes. Maybe Meccano intended to make individual boxes for the liners but in this case there have to be found more Rex boxes and there must have been an announcement in Meccano Magazine . And most important there would have been a label for it as on most other boxes. So just a very small number of the Rex box has been made and in my opinion for a special occasion, a promotional item? In any case very very rare and a highlight in any collection. I still hunt this box. Some liners were also made in lead and in my collection Rex and Norddeutscher Lloyd. Thanks for your kind words and explanation on the Rex box. Indeed on the box itself is no mentioning of Dinky Toys or Meccano or even Made in England. Perhaps we will find out without a doubt that this is a promotional issue or not. In the mean time I like to think it was bought onboard the actual ship during a crossing. On 8 September 1944, off Koper, Rex was hit by 123 rockets launched by RAF aircraft, caught fire from stem to stern. She burned for four days, then rolled onto the port side, and sank in shallow water. The ship was broken up at the site beginning in 1947. A sad end of a beautifull ship. Thank you for your answers and elaborate additional information regarding the Rex model (albeit after 5 years and not in that thread). Thank you Rob and John, for all this interesting information about the Rex and other Liners. The only tradebox that I have seen so far for these ships is a 52 A for the Queen Mary. â€¢ Was a tradebox ever made for the Normandie ? â€¢ and the other liners ? â€¢ In which type of box were they issued in France ? Some of the liners have been imported to France in 1935 until June or July 1939 and the prices are about the same for all the ships although the type of box is not specified. 51D Empress of Britain 4.00 Frs. 52A Queen Mary 6.00 Frs. 52D Normandie on rollers 7.00 Frs. 51D Empress of Britain 6.00 Frs. 52A Queen Mary on rollers 8.00 Frs. 52D Normandie on rollers 8.00 Frs. Only the Queen Mary and Normandie are available.